Is my pet safe to be around? Yes, your pet is safe to be around after treatment. Being around family members – human and other pets in the home – is an important part of your pet’s life. Enjoying normal activities together – including petting, hugging, and kissing – are all safe. However, the excretions (urine, feces, vomit) from pets receiving chemotherapy can be hazardous. It is therefore important to minimize our exposure to chemotherapy, and common sense precautions should be taken. If you are administering chemo at home, please follow these precautions. Keep the medication in the vial, and do not store it in the kitchen. Ensure children and pets do not have access to the drugs. Do not eat, drink, or chew gum when giving the medication. Do not crush or break the pills or capsules. Wear unpowdered latex or non-latex gloves when handling the medication. Some medications, like Palladia are coated, and you can handle the pills without gloves. However, the coating breaks down when the pill gets moist. So if your dog spits out the pill, please put on gloves prior to picking up to readminister. Dispose of the gloves promptly, and wash your hands thoroughly after administration. My primary safety concern is for people who are mixing and handling chemotherapy agents. For those of you who are bringing your dog home after a chemotherapy session in the hospital, there is less risk, because you are handling the urine and feces. Sounds gross, I know, but the metabolites in chemotherapy drugs have been broken down by the patient’s body by the time they reach the urine and feces. These metabolites are far less active than the original drug was. So, it’s a safer scenario than the one above. Still, please use common sense precautions and follow good basic hygiene. Wear gloves for handling of feces, urine or vomit (i.e. if they have an accident in the house/apartment, cleaning the litter box) for at least 72 hours after treatment. Soiled bedding should be washed separately and go through 2 wash cycles before being used again. Use detergent to clean floors, carpets, or countertops. Wear gloves when cleaning. Accidental exposure: Wash skin thoroughly. If your skin becomes irritated, contact your physician. What it my other pet eats the poop of the dog getting chemo? But this happens, sometimes, right? So how much should you panic? It depends on the chemo drug. Some are excreted mostly in the urine, like cyclophosphamide. (That’s why it’s good to encourage your pet that gets this to pee on grass, where urine will drain quickly.) If your dog has had a treatment with one of these drugs, the likelihood that another dog will literally ingest it is rather small. But some drugs, like vincristine and doxorubicin, are metabolized and excreted in the feces. If your dog has just had one of these drugs in a chemotherapy session, and your other dog (or any other dog) comes along and eats it, yes, there is a risk that dog would get a smaller dose of the broken down chemo metabolites. For example, if a patient’s canine companion ate all the patient’s feces over a 72 hour period it would ingest about 30% the original dose, of which much would be destroyed in the gastrointestinal tract and pooped out. Remember it is not unchanged chemo drug being excreted, but metabolites, and the risk is relatively low. So again, use common sense precautions to minimize exposure. Which basically means pick up your dog’s poop as soon as it is released. Please avoid contact with any chemotherapy drugs. Also, please avoid contact with your pet and your pet’s waste for a minimum of 72 hours after chemotherapy has been given. My dog has cancer. Vet want to treat her. she had tumors around her hind quarters. They were removed but he wants to continue chemo. Should I? She is a pit bull. In the Dog Cancer Survival Guide, Dr. D highly recommends that you become your dog’s Primary Healthcare Advocate. You know yourself, and your girl the best. There are a number of factors that you have to take into consideration (finances, your dog’s personality, your personality, treatment options, age, etc) before making a decision, as each dog and their health situation is different. 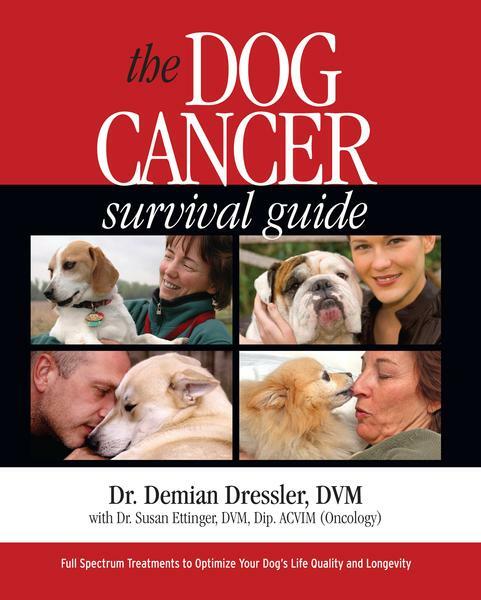 As Dr. D writes in the Dog Cancer Survival Guide, there are a number of treatment options, besides chemo, surgery, and radiation, in the Full Spectrum Cancer Care that you could consider, under your vet’s supervision– Nutraceuticals, Diet, Brain Chemistry Modification, and Immune System Boosters and Anti-metastatics. Hello, I have a male Irish Wolfhound going through CHOP for Lymphoma. We also have a still growing young adult and a 6 month old puppy in the home. We separate our male for the first 72 hours after chemo, allowing him access to our family room, dog room and outdoor concrete pad through a dog door for elimination. We’ve previously hosed down the pad after spraying with a hydrogen peroxide cleaner and allowing it to sit, but I’m not sure if this actually does any good and I’m still unsure about letting the growing dogs use that part of our yard ever. What is the best way to manage the situation to allow them access to our dog yard, particularly during inclement weather? How long do the metabolites stay active on concrete? How worried should I be about their growth being damaged by cytotoxic waste residue? Thanks! Hello Tamara, thanks for writing. Unfortunately, we don’t necessarily know for SURE how long these metabolites stay active. As Dr. D points out in the chapter on Cancer Causes, pharmaceuticals in our water system in the U.S. are a real (unaddressed) problem. Drugs can stay active for a very long time before they break down, and even drugs that have been metabolized by our bodies (or in this case your dog’s body) can still be active in part, even after they pass. As Dr. Ettinger (Dr. Dressler’s oncologist co-author and the author of this article) points out, you don’t want to get paranoid about these things, but you have to take safety into account. In general, the way you are cleaning sounds about right, although detergent (soap, even dishsoap) might be a good thing to add. Also, if your big guy can pee on the grass, it would be easier for the urine to drain. We assume you are picking up feces immediately and throwing away the tightly sealed bag. Meanwhile, keeping your younger dogs away from your big guy’s restroom while he is on chemo is a good idea. But keep in mind that we all do the best we can! Next time you visit your oncologist, you might ask about your current protocol and ask if that is a good plan, just to be sure. We hope that helps. Thank you! I’ll ask for more clarity at his next appointment.